Oracle Functions is currently in limited preview and is expected to soon reach wider availability. Rolando Carrasco did this write up on Medium about his first experiences with Oracle Functions. Oracle Functions is a managed PaaS service, based on Project Fn. It supports a serverless architecture with light weight functions that can easily scale and for which no infrastructure has to be configured or managed. Functions can be triggered for execution in several ways: from events, time scheduled, calls from other functions and of course through external calls. 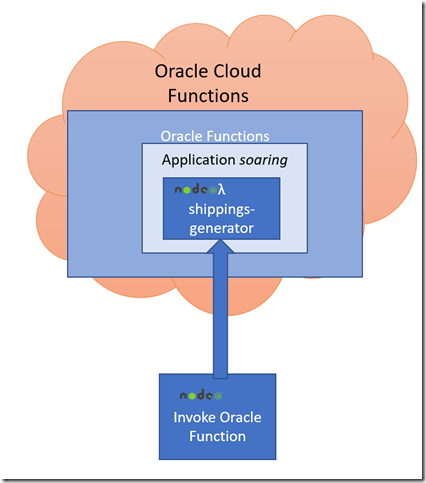 In this article I will describe how a function on Oracle Functions on Oracle Cloud Infrastructure can be invoked from a Node application. I have prepared a function called shippings-generator in an application called soaring. The language used for implementing this function is not relevant when making the call to it. We simply pass the input as JSON payload and whether the function was written in Java, Python, Go, Node or something else is of no consequence. The OCI REST API offers a set of resources and operations for Functions – also currently in preview. This gives me the endpoint I need to pass to the OCI REST API in order to have it trigger my function. Before making this call for the specific function, I have configured the Node application for my tenancy, compartment, user and key as described below – and as usual for interactions with the OCI API. The logging is produced – to Console, File and Papertrail in my case – and the function does whatever it is supposed to do.